Join us for THE NFL Draft Event! NFL DRAFT - 2017 NFL Draft Party! Join former players have fun, celebrate the game and do some good! This Draft Party will be unlike any other draft party in the city as we have partnered with NFL Players Association – Atlanta Chapter to host the 1st UNITY NFL DRAFT PARTY for ALL TEAMS!!!!! That’s right… The NFL PLAYERS ASSOCIATION has partnered with the United Pro Football Fan Clubs of Atlanta to host the LARGEST NFL DRAFT PARTY outside of being at the actual draft itself. Yes, the bar has been raised, and HISTORY will be made where we will have all team fan clubs in the same building!!!!! 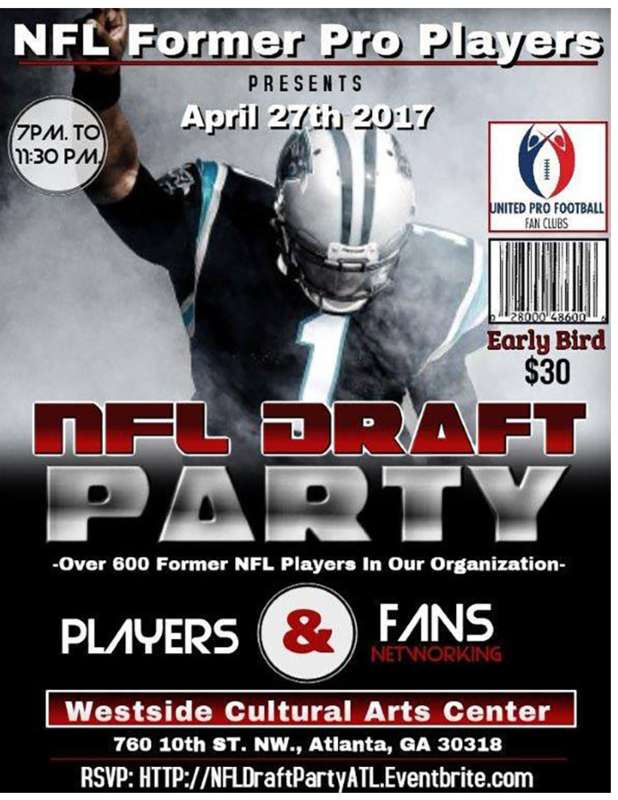 Welcome to the 2017 NFL Draft Party Hosted by The Atlanta NFL Former Players Chapter. Meet NFL Players, Former Players, Pro Bowlers, Super Bowl winners and hear their input on YOUR teams draft picks. Join us for an evening of fun filled with Food, Drinks and Music all while watching YOUR team draft new talent for the upcoming football season. Don't be late!! Get your Ticket and enjoy this opportunity to celebrate the evening with the Pros of Atlanta. Advance tickets are just $30 and include: Admission, all you can eat, one drink ticket and cash bar, and lastly 30-50 NFL PLAYERS!